A sprain is a ligament injury caused by excessive stretching of the ligaments. A sprain can be sustained by exercising or exaggeration of general activity. Restricting movement of the injured limb is important to starting the healing process. If you have sprained your hand, wrapping it with an ACE bandage is a simple way to prevent further injury and to stabilize the hand. 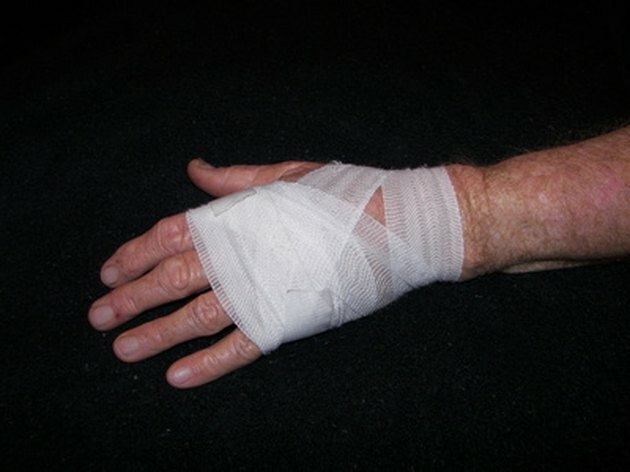 Wrapping the hand in conjunction with other treatment methods will ensure a speedy recovery. Purchase an ACE bandage for your local pharmacy, drugstore or grocery store. You may want to purchase two to be able to alternate between wrappings. Although optional, you can purchase a topical cream, such as Aspercreme or Ben-gay, to apply prior to wrapping your hand. These topical creams contain pain and inflammation relieving agents. Apply the cream and rub into your hand prior to applying the bandage. Start by wrapping the area above the knuckles two times to create a base for the remainder of the wrap. Wrap towards the wrist, wrapping each section of the hand twice. Wrap the remainder of the hand, including around the thumb. Continue wrapping until the entire hand is covered taking care to wrap securely but not too tight. If the bandage is too tight, you may experience swelling or pain. Secure the end of the bandage with a bandage fastener (typically included in the packaging of the ACE bandage). Loosen the wrap if necessary to avoid tightness or swelling. Remove the bandage when showering or bathing. Reapply the bandage afterwards. Wash the wraps after each use to keep them clean and avoid any potential infections. Take over-the-counter non-steroidal anti-inflammatory drugs (NSAIDS) as needed for pain or to reduce inflammation or swelling. After two days, gradually increase the movement and range of motion. Do this by slowly rotating the wrists back and forth as well as extending and contracting the fingers. Sprains are generally treated according to the PRICE method: Protect, Rest, Ice, Compress and Elevate. If symptoms haven't improved in two or three days, contact your doctor.